The 10 neighbourhoods with the highest quality of life in England are all in London's commuter belt, according to government statistics. Of 32,482 neighbourhoods assessed, Chorleywood West, Herts, came out on top, followed by Crowthorne, Berks. The study was based on criteria including employment and crime rates, local facilities and depression levels. The seven most deprived neighbourhoods in England are in Liverpool and Manchester, according to the figures. But London's affluent south west suburbs such as East Sheen and Wimbledon Village also scored highly. The unprecedented study drew on the huge range of information collected by government departments, and will now be used by civil servants and councils to help formulate policy. It will inform next year's allocation of £525m Neighbourhood Renewal Fund grants. 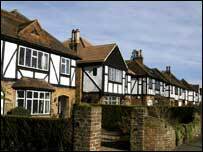 The neighbourhoods were judged on 37 criteria, including employment and crime rates, school results, access to shops and post offices, the proportion of detached and semi-detached homes, owner-occupiers families with two or more cars, university graduates, and people suffering from anxiety or depression. In Chorleywood, one out of every two households have at least two cars, and four out of every 10 adults have a university degree - far above the national average. Chorleywood Parish Council clerk Yvonne Merritt told BBC News: "It is a nice place to live. "We have good schools, a thriving library and a nice community atmosphere," she added. "It is quite affluent, and we have this fantastic common. "A lot of people here are proud of where they live and look after it. "Crime is very very low in comparison to everywhere else," Ms Merritt told BBC News. "We have good neighbourhood watches," she added. "The police officers know the kids by name. "People are moving out of London and coming to suburbia - but a suburbia that has really got that village atmosphere, which is what people want nowadays," Ms Merritt told BBC News. "It is very villagey - but we have the amenities of a large town," she added. "Within a five-minute walk, you are in the countryside - but we also have the Metropolitan Line, which takes you straight into the city. "That makes most people happy." The town's Saint Clement Dane's School head teacher Josephine Valentine added: "We were named by Her Majesty's Inspectors of Schools as an outstanding school, in February. "We have just had a great triumph with our volleyball team, who are England under-18 champions. "We are excellent at gymnastics and athletics as well as all sorts of sports." The return of high-rise Britain? Is this the nicest place to live in Britain?